Eleven million acres of prime farmland were lost to urban sprawl in a 15 year period. Some small cities are embracing the growth and helping developers circumvent so-called Smart Growth restrictions on sprawl. Researchers have found that small towns hungry for new tax dollars are making it possible for developers to get around Smart Growth Plans. Often the result is urban sprawl that paves over farmland and natural areas. The Great Lakes Radio Consortium’s Lester Graham reports. Despite the best efforts of some politicians to slow down the pace of turning farmland into suburbia, the 2000 Census shows population growth is exploding at the edges of Metropolitan areas, and all those people need somewhere to live and shop. So, in the Midwest, often housing developments and shopping malls are built where corn or soybeans grew just the year before. For example, Kane County, Illinois, as recently as the 1970’s was predominately farmland. Now with more and more people moving there, only about half the county is left for farming. Randall Road cuts through the heart of the county, although housing developments and retail stores are starting to infringe on the country setting, on one side of the road you can still see rows of crops and pasture, and on the other side of Randall Road, it’s nearly solid shopping malls and subdivisions. But in the middle of all that development, there’s still one dairy farm. Mike Kenyon and his family still grow hay and corn, and milk cows here. But their fields are surrounded by three sprawling towns. Kenyon says Randall Road used to be the line where planners said urban sprawl would stop. They were so confident that they even said so in their planning document for the year 2020. And that, Kenyon says, is what’s now happening on the other side of Randall Road where Kane County was supposed to remain rural. Kane County officials are trying to implement all kinds of programs to save the remaining farmland from urban sprawl, or at least keep urbanization to certain areas of the county. But at the town and village level, many local politicians see growth as nothing but good and are willing to expand their city limits to include developments. That’s because those developments help increase their tax revenue. The story is not unique to the Chicago region. It’s being repeated throughout the Midwest and the Great Lakes, as well as across the United States. So much so that millions, yes millions of acres of prime farmland in the U.S. have been lost in a little more than a decade. Rich Green is a geographer at Northern Illinois University. He’s been tracking the fringes of the ever-growing Chicago Metropolitan area. He’s been adding up just how much former cropland has been turned into suburban lawns and parking lots. Green also found, perhaps coincidentally, that an identical amount of land, eleven million acres of rangeland was plowed up and put into crop production during the same period. Green says shifting farming to less productive and more environmentally damaging land might not be the intent of the small towns that want to grow, but that’s the apparent result. Just off campus at Northern Illinois’ Social Sciences Research Institute, Director Harvey Smith says Midwest states such as Illinois should take the time to better learn and weigh the costs of continued urban sprawl. Many times government at a more regional level, such as at the county level, is struggling with balancing development and farmland preservation. 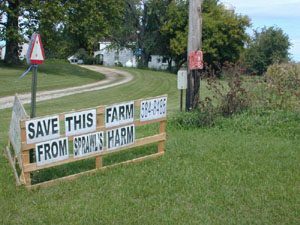 Even though it’s something of a contradiction, Smith says the people who move to the suburbs’ fringes causing further urban sprawl, actually want to preserve some of the farmland. For some towns, it’s too late to recover the rural character and small town charm they lost to development, but for those at the fringes of the sprawling large metro areas with adherence to Smart Growth planning, some planners believe there’s still the opportunity to preserve a little of the setting of the suburbs that drew so many people there in the first place. Previous PostPrevious Will Environment Be on Back Burner?